Charmingly rugged and with just the right amount of feminine detail, the Back Laced Steampunk Harness will take any steampunk outfit to the next level. This faux leather underbust harness comes in your choice of black or brown. In the post apocalyptic world, you never really know what is going to come your way or where you will need to go next. Channel the look of a world explorer in your neo-Victorian wardrobe with the Belted Steampunk Harness with Satchel. 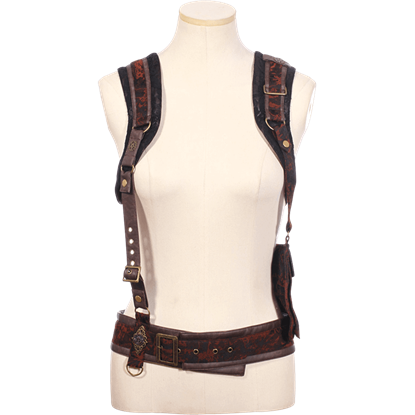 This Faux Leather Steampunk Harness is a garment that looks like a combination between an underbust corset and a bodice. In truth it is neither, being a completely unique piece that can be used to create a unique and distinctive style. Fans of the steampunk genre will turn green with envy when they see you in the Golden Steam Skirted Buckle Vest! A fantastic combination of a jacket and an underbust bodice, this alternate history themed coat is an incredible buy! This fantastic halter waistcoat adds instant style to any ensemble and can be worn on its own or with a blouse. The Steampunk Black Halter Waistcoat features brass snaps, D-ring, and chain details that offer it charm. A travel through time requires a suitable set of clothes. 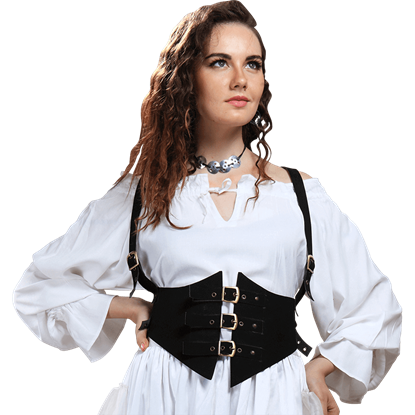 Match the Steampunk Underbust Front Clasp Vest with a period skirt, blouse, and accessories before you venture forth into the fascinating world of the Neo-Victorian Era. Whether it is pre or post apocalypse, nothing beats a handy harness that helps you look good and offers some versatility, too. In this case, the Womens Leather Underbust Harness offers good looks and possible utility in spades.